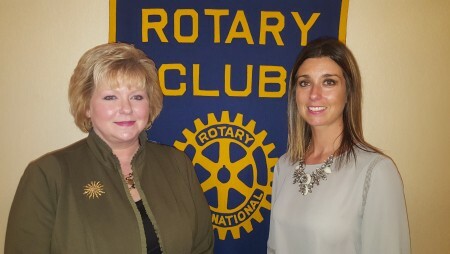 At its meeting on Wednesday, Nov. 15, the Auburn Rotary Club hosted Dr. Nancy Merner (right), an assistant professor in the Department of Pathobiology at Auburn University's College of Veterinary Medicine. Dr. Merner discussed her research focus on studying the genetics of breast, ovarian and prostate cancer through novel gene discovery efforts, and her community-based educational and outreach efforts throughout Alabama using The Gene Machine bus. Pictured with Merner is Club President-Elect Hope Stockton (left). The Auburn Rotary Club meets each Wednesday from noon to 1 p.m. at Saugahatchee Country Club. For more information about the Auburn Rotary Club or how to become a member, visit www.auburnrotaryclub.com.